Nuclear energy currently provides around 11 percent of the world’s electricity. China, the European Union, the United States, India, Russia, South Korea, and other nations’ have major existing fleets. The World has hundreds of units under construction and proposed. And, existing reactors which have reached their original estimated operating lives are being relicensed. These factors, together with recent limited investment in new uranium exploration and development, might be good indicators of future improvements in uranium markets for potential investors looking at the sector. According to the World Nuclear Association, China has 27 nuclear reactors in operation and another 27 under construction, with almost 100 more planned by 2030. Some of the world’s most advanced reactors will give China a three-fold increase in nuclear capacity to at least 58 gigawatts by 2020-21 and a further 150GW by 2030. China has also committed to an ambitious target of building around 30 nuclear power plants in countries along the One Belt and One Road initiative by 2030. India is also in the midst of a major expansion of nuclear-power generation. Their target is to generate 25 percent of electricity from nuclear power by 2050, that’s up from four percent in 2013. Canada’s Cameco, the world’s largest listed uranium mining company, signed a five-year deal with India’s Prime Minister Narendra Modi to buy 3,000,000 lbs. of U3O8 annually to supply fuel to Indian nuclear reactors. Japan has restarted four reactors, which will accelerate in the coming years as the country returns to atomic energy, thereby reducing the chance that uranium and nuclear fuel will be sold into the market. Japan has restarted two nuclear reactors last year (at Sendai) and two more this year (at Takahama), and in total about 30 of Japan’s 54 nuclear plants will likely be restarted in the coming years. While this represents only about 55% of the number of reactors operating pre-Fukushima, the units being shutdown are their smaller, older models that don’t use as much uranium. It is estimated that Japan will return about 65%-75% of their previous capacity to service – and uranium consumption. However, idling Japan’s reactors for a few years caused Japanese utilities to accumulate about 120 million pounds of uranium (they still honored their existing supply contracts). This is enough fuel to last the country’s nuclear fleet about 10 years. Therefore, Japanese utilities might not be purchasing much uranium for a few years, but they shouldn’t be sellers holding back the spot price either. Foratom, the European Union’s (EU) nuclear trade body stated that the EU should at least maintain its current capacity of nuclear power generation up to and beyond the year 2050. This would entail the start of more than 100 reactors over the next 35 years. According to World Nuclear News, this target delivers 122 GWe worth of nuclear capacity between 2025 and 2045. Handelsblatt, a German business and financial publication reports the European Commission is set to recommend investing 450 to 500 billion euro’s into nuclear power by 2050. Of that, between 45 and 50 billion Euros would go towards maintaining existing power stations. The remainder would be invested in building new plants. The U.S. Energy Information Administration (EIA) forecasts an 18 percent growth in electricity demand in the U.S. by 2040. 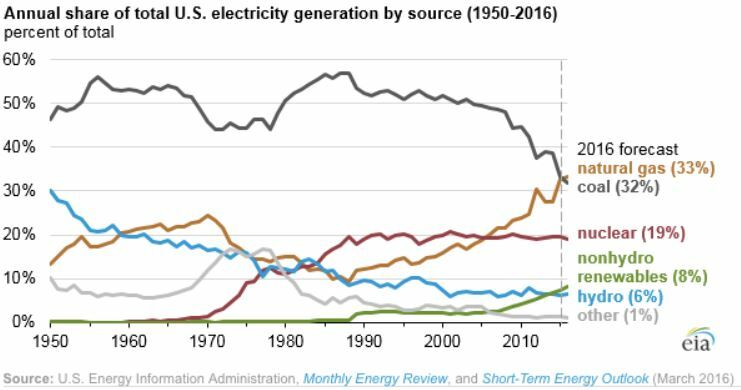 To maintain the benefits of a balanced mix of clean energy sources, the United States will need more than 100,000 megawatts of new nuclear-generating capacity by mid-century. In the United States, about 90% of the country’s existing reactors will soon be relicensed for another 20 years, many for another 40 years, keeping the United States the biggest producer of nuclear power – at least until China surpasses the U.S., likely in the mid-2020’s. The U.S. currently has a fleet of 99 nuclear power plants. Like Japan, the U.S. is closing down some of their smaller older units, but replacing them with large reactors of 1,200 megawatts or more. Current plants produce more than 60 percent of the United States’ carbon-free electricity, far surpassing solar and wind energy combined. Because many countries consider energy independence and global warming as two of their key policy issues, governments attending the 2015 COP21 climate meeting in Paris forged a landmark agreement to reduce green gas emissions. They can only achieve these commitments by replacing the countries transportation fleet with electric vehicles, weaning citizens off fossil fuels, and increasing nuclear power use. Wind and solar simply cannot do it alone. The primary greenhouse gas emitted by human activities in the United States is CO2 – 83 percent of total greenhouse gas emissions. Fossil fuel combustion is the largest source of U.S. greenhouse gas emissions and has accounted for approximately 78 percent of emissions since 1990. Electric vehicles (EVs) have far fewer moving parts than Internal Combustion Engine (ICE) gasoline-powered cars – they don’t have mufflers, gas tanks, catalytic converters or ignition systems, there’s also never an oil change or tune-up to worry about. Driving performance is excellent, prices are dropping … plug and go, convenient and very green! But the clean and green doesn’t end there – electric drives are more efficient then the drives on ICE powered cars. They are able to convert more of the available energy to propel the car, therefore using less energy to go the same distance. And, in some vehicles like the Prius, applying the brakes converts what was simply wasted energy in the form of heat to useful energy in the form of electricity to help recharge the car’s batteries. The bottom line for us earthlings is we need to de-carbonize energy. The earth’s population is projected to climb from its current seven billion people to upwards of ten billion by 2050. Most of this population growth will come from developing countries. All the people without power and all the new people will want some kind of vehicle, a motorbike, an electric scooter. They will want TV’s, laptops, air conditioners, washers and dryers, phones, etc. Nothing brings more people out of poverty than cheap and available energy. These people will need electricity, not only to power all their modern conveniences, but to provide clean water, efficient heating and cooling, hospitals and clinics, schools and universities, modern medicine and innovation, etc. They all want – and they deserve – the very same amenities we in the West take for granted. And this will require enormous amounts of energy. “A year’s operation of a 1,000-MW coal plant produces 1.5 million tons of ash – 30,000 truck loads, or enough to cover one and a half square miles to a depth of 40 feet – that contains large amounts of carcinogens and toxins, and which can be highly acidic or alkaline depending on the sulfur content of the coal. Also, ironically, more unused energy is thrown away in the form of trace uranium in the ash than was obtained from burning the coal. Getting rid of it is a stupendous task, and it ends up being dumped in shallow landfills that are easily leached out by groundwater, or simply piled up in mountains on any convenient site. And that’s only the solid waste. In addition there is the waste that’s disposed of up the smokestack, which includes 600 pounds of carbon dioxide and ten pounds of sulfur dioxide every second, and the same quantity of nitrogen oxides as 200,000 automobiles. An equivalent-size nuke, by contrast, produces nothing in addition to its cubic yard of high-level waste, because there isn’t any chemical combustion. I wrote the following about shale gas 3 years ago that discusses the limitations and risks associated with the recent oil and gas boom. In case you think ‘fracking’ for oil and gas is to be our energy savior, you might want to think again. The key to today’s boom is the now widespread use of certain technologies. Hydraulic fracturing, or “fracking”, and horizontal drilling have tapped huge resources previously thought unrecoverable. However, the decline rate of shale gas wells is very steep. A year after coming on-stream production can drop to 20-40 percent of the original level. The shale gas energy boom is not sustainable, will be shorter lived than most anticipate and its global potential is vastly overstated in my opinion. Throughout human history, we have harnessed increasingly effective forms of energy. From human power to horse power, to wood, to windmills, to dams, to coal, to natural gas, and finally to nuclear energy powered by uranium in the past 40 years, we’ve been working our way up the energy efficiency ladder. In reality what we’ve been doing is searching for the highest energy density to make energy production more efficient. 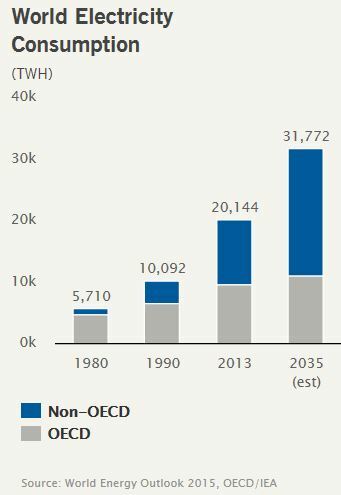 World energy demand is set to rise 37% by 2040, according to the IEA. Only nuclear power can meet the clean, efficient, and consistent base-load power generation that many nations are seeking. The electricity needed for any country to successfully replace fossil fuels, both for transportation and everyday use, will have to come from nuclear generation. Coal, oil, and natural gas plants emit carbon dioxide emissions and natural gas needs an incredible amount of investment in pipelines and supporting infrastructure. I call fossil fuels are the “original solar power” since they are mostly comprised of plants that once harnessed the power of the sun millions of years ago (still, fossil fuels are more efficient than modern solar panels). Solar, wind and geothermal are all niche suppliers and simply will not work on a large scale. Geothermal seems to be limited to a few locations of any given country. And, all three alternative means of generating electricity need massive investment in power transmission lines to get the power to where it’s needed. All three of these technologies are extremely important and each will successfully contribute, in a small way, to energy independence. But none are capable today of supplying base-load 24/7 power. A 1,000-MW solar plant would cover 129 to 259 square kilometers and use a thousand times the material needed to construct a nuclear plant of the same capacity; and this does not consider the fact that solar plants typically operate at less than 20% of capacity, while nuclear power plants typically operate in excess of 95% of their capacity. To equal the output of South Korea’s Yongwangs six 1,000-MW nuclear reactors, wind generators would require an area 245 kilometers wide extending from San Francisco to Los Angeles. Solar would require roughly 52 square kilometers of collector area. Again, this does not even consider the capacity factors. Finally, while hydroelectric produces clean, no-carbon energy, most of the best damsites have been used And, in my view , developing clean eco-friendly energy isn’t accomplished by damming what free-flowing rivers are left! Today, there is a global movement to develop higher levels of nuclear energy production. This is because nuclear energy works. The new generation reactors are extremely safe, including passive shutdown systems. And even among environmental activists – some of whom use to be strictly anti-nuclear – recognition is slowly dawning that it’s going to be impossible to meet the global, growing demand for energy and cut carbon dioxide emissions without nuclear energy. Nuclear power’s life-cycle emissions range from 2 to 59 gram-equivalents of carbon dioxide per kilowatt-hour. Only hydropower’s range ranked slightly lower at 2 to 48 grams of carbon dioxide-equivalents per kilowatt-hour. Wind comes in at 7 to 124 grams and solar photovoltaic at 13 to 731 grams. Emissions from natural gas fired plants ranged from 389 to 511 grams. Coal produces 790 to 1,182 grams of carbon dioxide equivalents per kilowatt hour. According to a  study, nuclear is the safest way to produce electricity on the basis of deaths per unit of output – outclassing even supposedly safe technologies like wind and solar. Indeed a  study by the UN estimated that over 7 million lives have been saved through the use of nuclear power, due its air pollution reducing characteristics. Nuclear energy and hydroelectric are the only proven zero-carbon technologies that can deliver baseload electricity on a large scale, 24 hours a day, 7 days a week. Nuclear power plants emit no carbon pollution—no carbon monoxide, no sulfur oxides, and no nitrogen oxides to the atmosphere. Natural gas accounts for 80% of the cost to produce power from an NG power plant. Uranium accounts for 5%–10% of the price of nuclear energy. As a result, if there were a doubling in the price of both uranium and natural gas, the utility – and their ratepayers – will be much better off getting their power from nuclear. Power production cost results when comparing nuclear/gas, nuclear/coal or nuclear/hydro – only coal is cheaper. Nuclear power plants require very little space especially in comparison to the equivalent power needed from wind or solar plants. Germany walked away from nuclear power to supposedly rely on wind and solar. Germany is greenwashing the world. They need to import more and more nuclear produced electricity from Holland, the Czech Republic and France to cover their self-inflicted power shortfall. And that’s not all there is to this story. France relies on electric heaters for heating many of its homes, the country’s energy needs rises over 2000 MW, the equivalent of two nuclear plants, for every one degree drop in temperature. Germany helped cover their own, and the French energy shortage, by using its existing coal-fired plants. There are twenty three new coal fired power plants under construction in Germany. Why so many? Because Germany is worried about the increasing cost of electricity which is now among the highest in the world..
Here’s a staggering reality, Germany opened a $3.4 billion 2200 MW coal fired power plant in August 2012. It vomits 13 million tonnes of CO2 per annum. In one year, in just one year, that one coal burner will generate one million times more CO2 than Germanys entire nuclear fleet would have over 20 years! Nuclear power has avoided the release of an estimated 56 gigatonnes of CO2 since 1971. That’s almost two years of total global emissions at current rates. Bank of America-Merrill Lynch (BofA/ML) and BMO Capital forecast uranium prices will rise to US$60 a pound by 2018. According to the World Nuclear Association 150 million pounds of uranium are estimated to have been consumed in 2015. BofA/ML forecasts consumption will rise to almost 200 million pounds by 2020. And, this does not include inventory-building in places like China and India. Industry consulting group UX Consulting believes uranium demand will grow 61% by 2035 to 238 million pounds, up from 173 million pounds in 2014. Kazakhstan is the world’s biggest uranium producer, followed by Canada and Australia. The United States is the biggest consumer (about 50 million pounds of U3O8 in 2016), followed by France and China. Of the 53.3 million pounds U3O8 (20,500 tU) purchased to fuel US reactors in 2014, only 3.3 million pounds U3O8 (1270 tU) came from domestic production. Presently, there are 440 operable nuclear power plants in ten countries of the world, 65 reactors are under construction, 173 are planned and 337 are proposed in different countries. Each GWe of increased new capacity will require about 150 tU/yr of extra mine production, and about 300-450 tU for the first fuel load. “We expect global uranium demand to rise 40% by 2025. Annual growth of 2.8% might not sound like a lot, but is massive for a commodity that has seen precious little demand growth since the 1980s. Consider that average annual copper demand growth of less than 3% from 2002 to 2012 was enough to drive a 336% price increase. Mined supply of uranium will struggle to keep pace amid rising demand and falling secondary supplies. Low uranium prices since Fukushima have left the project cupboard bare. We expect a cumulative supply deficit to emerge by 2021. Kazakshtan has been the world’s largest uranium producer since 2009, accounting for 41% of world production in 2014. Kazakhstan signed cooperation agreements with Chinese companies to build a nuclear fuel plant in Kazakhstan, they are also talking to Russia about building a reactor in the country. Although China produces only 4 million pounds of U3O8 annually, the country currently consumes 19 million pounds per year. 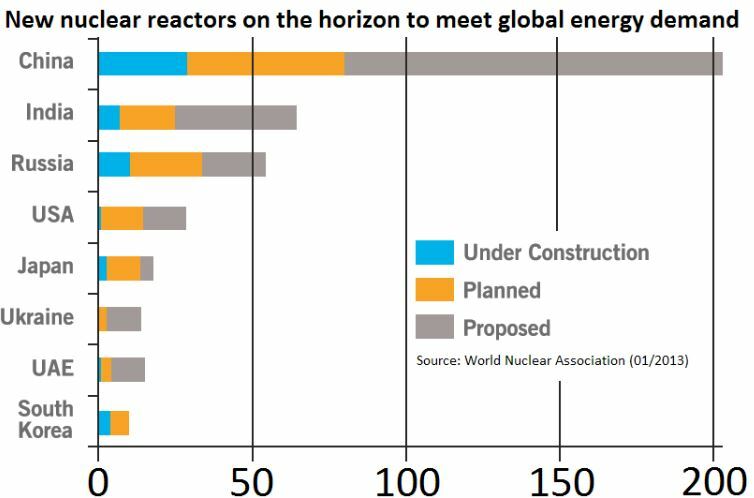 China’s planned increase in nuclear energy will raise that amount to over 70 million pounds (James Conca, Forbes, Jan 4th 2016, As The World Warms To Nuclear Power, The Outlook For Uranium Is Up) by 2030. By 2020, China alone will consume the equivalent of one-third of today’s global uranium market. China and Russia have already begun aggressively buying up huge stakes in uranium mining operations around the world in order to stockpile uranium to meet their rising domestic demand .”Virginia Uranium Inc. According to the US Energy Information Administration (EIA), Kazakhstan became the leading supplier of uranium to US nuclear power plants in 2014. Also according to the EIA’s Uranium Marketing Annual Report of the uranium purchased by US reactor owners and operators, 40% was of Kazakh, Uzbek, and Russian origin, while 20% came from Australia and 18% from Canada. The EIA also said that 12 million pounds U3O8 (4616 tU) purchased from Kazakhstan in 2014 was almost double the 6.5 million pounds (2500 tU) of Kazakh-origin uranium purchased by US plants in 2013. Russian state nuclear corporation Rosatom and Uranium One Holding (U1H), owns roughly 20 percent of U.S. uranium production capacity or 11 percent of the extracted uranium in the U.S. in 2014. Anytime foreign dictators begin making ominous noises about seizing and nationalizing foreign mining assets, it often leads to reduced investment, efficiency, and production. The decline of US nuclear capabilities and influence at all stages of the nuclear fuel cycle shows a shocking attitude of neglect towards energy security of supply in the world’s largest nuclear power user. The USA, and most other countries, are highly reliant on foreign sources for their uranium – in 2014 54% of world production came from just ten mines in six countries, with these six countries providing 85% of the world’s mined uranium. A country’s dependence on imported energy increases its strategic vulnerability. Energy suppliers who are willing to do so can use their energy resources as political leverage – holding whole countries hostage – to pursue their own policies. Russia supplying natural gas to Europe comes to mind. Supply price shocks and market disruptions could happen if there are problems (terrorist attack, NGO interference, natural disaster, technical problem) with any of the major supply sources. The concentration of uranium production in a few large mines should be of major concern. Cigar Lake flooding in the mid-2000’s comes to mind – which played a major role in causing the price of uranium to skyrocket to $138 per pound. Accessing a sustainable, and secure, supply of raw materials is going to become the number one priority for all countries. Increasingly we are going to see countries ensuring their own industries have first rights of access to internally produced commodities. If any country is to end its dependence on foreign supplied fossil fuels and vastly reduce its carbon footprint it will have to develop its own source(s) of uranium. Global climate change, reducing our carbon footprints, weaning ourselves off fossil fuels and achieving energy independence are all key issues facing us and future generations and the herd is not paying attention to HOW our future power is going to be supplied. But as more and more investors figure out how we are going to produce our future energy, companies in the uranium sector could very well deliver spectacular gains for their shareholders. At least one uranium producer should be on every investors radar screen. 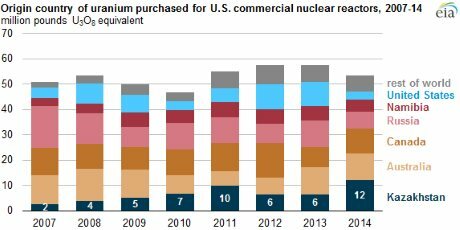 Over the past five years, Energy Fuels has grown to become one of the leading producers of uranium in the U.S. The company has capitalized on recent uranium price weakness, mainly caused by the earthquake and tsunami in Japan in 2011, to consolidate the best producing and prospective uranium properties in the U.S. And the company has made these acquisitions at very attractive valuations. Energy Fuels is focused on low-cost uranium production today and large-scale production growth in the future, providing investors with excellent leverage to improving uranium prices. In 2016, the company expects to produce about 1 million pounds of uranium utilizing both in situ(“ISR”) and conventional mining techniques. All of the company’s uranium is sold to global nuclear utilities, but with a focus on U.S. electrical generation. The company believes that being the leading name in the U.S. uranium sector is highly strategic, as the U.S. is currently the World’s leading producer of nuclear energy – and consumer of uranium. Energy Fuels is also in select company in the global uranium space. It is one of only three publicly-traded companies in the World with both ISR and conventional production – the other two being Areva and Cameco. It is the only company with both ISR and conventional production in the U.S. ISR production has the advantage of being generally low-cost, which is a benefit in today’s low uranium price environment. Conventional production has the advantage of being highly scalable – and there is low-cost conventional production including the company’s Pinenut and Canyon mines and its alternate feed material business described below. As a result, the company believes it is well positioned in a number of uranium market environments. 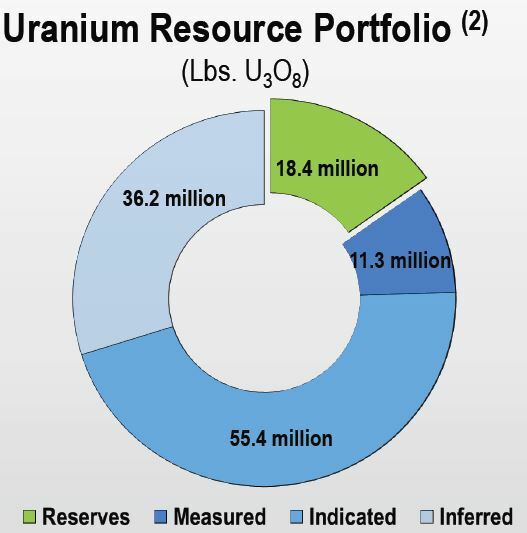 Energy Fuels’ ISR uranium production comes from its 100%-owned Nichols Ranch Project, located in the Powder River Basin of Wyoming, the most important uranium producing district in the U.S. today. The Nichols Ranch Project is comprised of the fully-licensed and operating Nichols Ranch ISR Plant and associated well fields. In 2016, the Company expects to produce about 350,000 pounds from Nichols Ranch. Nichols Ranch began production in early 2014, and in today’s weak uranium price environment, the company is expanding production, but only in a conservative manner. The Nichols Ranch Plant has a licensed capacity to produce up to 2 million pounds of uranium per year, and as uranium prices recover, the company expects to accelerate production growth. The company also owns several projects in the vicinity of the Nichols Ranch ISR Plant. This includes the Jane Dough Project, a new wellfield which will be connected to the Nichols Ranch Plant via pipeline. The company expects the Jane Dough Project to be fully-permitted by early 2017. The company also owns the Hank Project, which is currently licensed to be constructed as a satellite plant and well field to the Nichols Ranch Plant. Finally, the Company controls over 70,000 acres in the Powder River Basin that contain both identified ISR-amenable uranium resources and significant exploration potential. 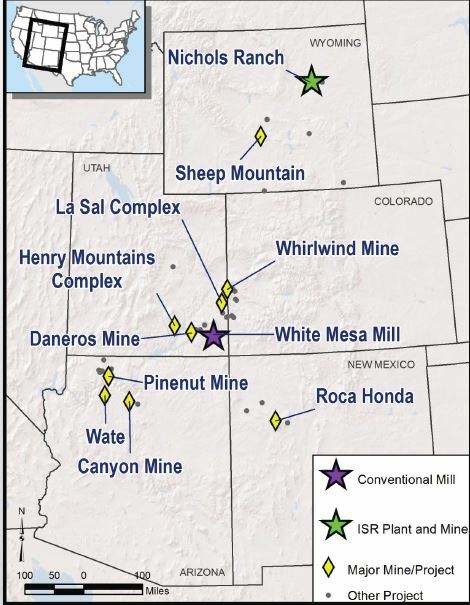 Energy Fuels’ conventional uranium production comes from its 100%-owned White Mesa Mill, located in southeast Utah. The White Mesa Mill, which is central to the highest-grade uranium deposits in the U.S., is the only conventional uranium mill operating in the U.S. today. The company expects to produce about 600,000 pounds of uranium from the White Mesa Mill in 2016. The mill is fed by conventional mines in the Four Corners region of the U.S., in addition to “alternate feed materials”, which are non-ore materials that contain recoverable quantities of uranium – often considered waste by those who generate them. Alternate feed materials are likely among the lowest-cost sources of uranium production in the World today. While the White Mesa Mill has produced an average of 1 million pounds of uranium per year for the past several years, it has a licensed capacity to produce over 8 million pounds or uranium per year. For 2016, the company has about 250,000 pounds of uranium contained in stockpiled alternate feed materials and 350,000 pounds of uranium contained in ore stockpiled from its recently depleted Pinenut mine. The company is also completing development at its high-grade Canyon mine, located in northern Arizona. The Canyon mine contains about 1.6 million pounds of uranium with an average grade that exceeds 1% U3O8, making it one of the highest-grade uranium mines in the World today. Furthermore, the company expects to complete an underground drilling program later in 2016 to further delineate the Canyon deposit. The company is optimistic about the potential to expand the known resources. The company expects to have salable uranium from the Canyon mine “in the can” in 2017 or 2018, depending on the results of the underground drilling program and market conditions. In terms of future production scalability, the Company is permitting three large-scale conventional uranium projects, which contain between 20 million and 30+ million pounds of uranium resources – each. These projects include the Sheep Mountain Project in Wyoming, the Roca Honda Project in New Mexico, and the Bullfrog Project in Utah. The company’s future large-scale production growth is likely to come from these three projects as uranium prices improve. Each of these projects boasts low operating costs, annual production of between 1 and 3 million pounds of uranium per year, long mine lives, and they should be ready to go into production in time to capture the expected uranium price recovery. Finally, the company is further expanding its low-cost production profile through its recently announced acquisition of Mesteña Uranium and its Alta Mesa ISR Project located in South Texas. Mesteña is perhaps not very well-known among the investment community, since it is closely-held. However, it is very well-known in the U.S. nuclear industry, as it produced nearly 5 million pounds of uranium between 2005 and 2013, including 1 million pounds per year during two of those years. The Alta Mesa Project currently has an operating capacity of 1.5 million pounds of uranium production per year. The projects’ properties sit on nearly 200,000-acres of privately-held land – or, roughly half the size of Rhode Island. The Alta Mesa Project hosts a permitted and operational ISR plant, along with permitted well fields located on about 5,000-acres that contain significant in-ground uranium resources. There is also an existing lease and exploration permit covering another 195,000-acres, with significant additional uranium resources and excellent exploration potential. Mesteña is especially attractive, since it boasts low “all-in” OPEX and CAPEX costs production. The company expects to place this project back into production as uranium prices climb back into the low-$40’s. Once a production decision is made, the company can be putting uranium “in the can” from this project within about 6 months’ time. After closing its acquisition of Mesteña (expected to occur in May 2016), the Company will have three production facilities with a combined capacity of over 11.5 million pounds of uranium production per year – all in favorable jurisdictions in the U.S. At these levels of production, Energy Fuels would be counted among the largest producers of uranium in the World. Energy Fuels has clearly emerged as the “go to” name in the U.S. uranium space, due to its low operating costs, current production capabilities, and ability to scale-up production as market conditions improve. Arguably, no other company has as much “torque” to rising uranium prices as Energy Fuels.